Not sure if cut/uncut would really have made a difference. I just felt that it was 'directionless' compared to the 'real McCoy' and thought that the leads were very lame compared to Bodie and Doyle. Having said all that... when watching things like NCIS and (new) Hawaii Five-0, I see that had it been made now, then The New Pros might have been better received. Sorry if this sounds stupid or was already covered. Are the DVDs uncut? Yes, the DVDs (Aussie & UK) are fully uncut. Not sure if cut/uncut would really have made a difference. I seriously couldn't believe how much had been hacked out of the versions aired on Sky in the UK. It was like watching a new series when seeing the episodes uncut. I was watching The Sweeney a few weeks ago on ITV4 and noticed that a lot of violence had been cut out of the episode - 'Down to You Brother'. Fortunately, Lizzie Dripping getting out of the swimming pool had been left intact. Which was... nice. Not tempted by that price. £15 for 13 Uncut episodes is not a bad price IMHO. I have the Aussie set so I am not tempted. Alf and FC, this was not a bad series at all. In fact, I truly enjoyed it. It's the perfect early evening's viewing after a very busy/hard day at work. Curtis and Keel were no Bodie and Doyle, granted, but had The Professionals continued in the '80s without Shaw and Collins, then very likely new actors would have been picked to play these new characters and very likely there would have been a Susan Fischer (Purging Of CI5) or Lexa Doig type person as well. Just to add a little more here to the US episodes; I now believe that First Strike and Choice Cuts were shot simultaneously and the same with Orbit and Glory Days. Thats the only way the limited call sheets I have make any sense. On top of that a second unit worked 6 days (last day 27th May). First Strike in production: 6-18 May; Choice Cuts: 6-15 May, and Orbit: ? and Glory Days: 19-29 May. Africa: 19 days filming were allocated of which Sunday 7th December was day 12 of 19; therefore the crew arrived Fri 21/Sat 22 November – and left Tues 16/Wed 17 December. Thanks for the info 45doyle. I honestly still think that Channel 5 or Bravo could have shown The New Professionals instead of Sky who chopped it to bits. In the late '90s and early '00s, Bravo had become a cult/action movie channel, showing lots of 18-rated stuff and repeating action series like The A-Team and Street Hawk. It would have been better if ITV had shown The New Pros but they weren't interested. A piece from THE BOX magazine in 1997 about bringing The Pros back. Thanks. Brian Clemens seems very forthright in his opinion about the new Professionals being shown on TV and that it will be the only tough British action series around. 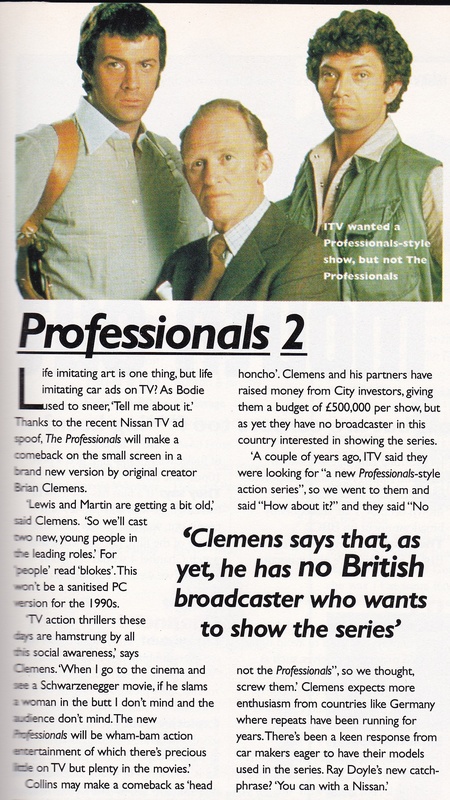 Interesting to note that ITV wanted a Professionals-style series but NOT The Professionals. 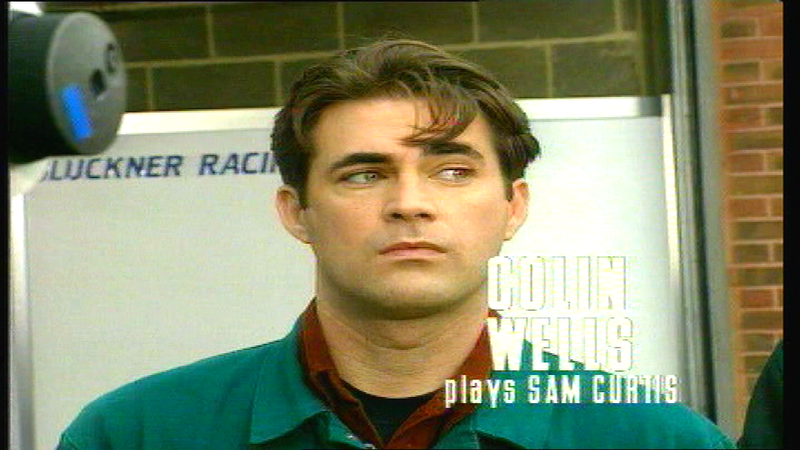 In fact, in April 1995, they showed a TV movie called Rules Of Engagement which was about a CI5-type police task force that operated under the Home Office. The late Bill creator Geoff McQueen wrote the script before he died. I think what happened was that it was a toss-up between this and Thief Takers as to which one would result in a series and Thief Takers won. Fair play, he looks dreadful! Great spot jno. Good to "see" his career is really going from strength to strength. He looks like he's constipated to me - sorry, I'll have to say it ... oh, how the mighty have fallen ... blockbuster action TV series with cash poured in to dodgy adverts on TV where he looks massively made up, poor old Colin. He'd probably make more doe signing New Profs boxsets. Don't worry Colin, we'll have a whip round at the next forum meet. Good idea jno. Lets get hold of his agent and see if he can play keyboards or drums next August. Honestly, if he's turning up in ads like this I reckon he'd be up for it, that's if he's not already booked his pitch up down Portreath beach flogging cornets and Lyons Maid. Sprinkles and strawberry sauce with that is it? 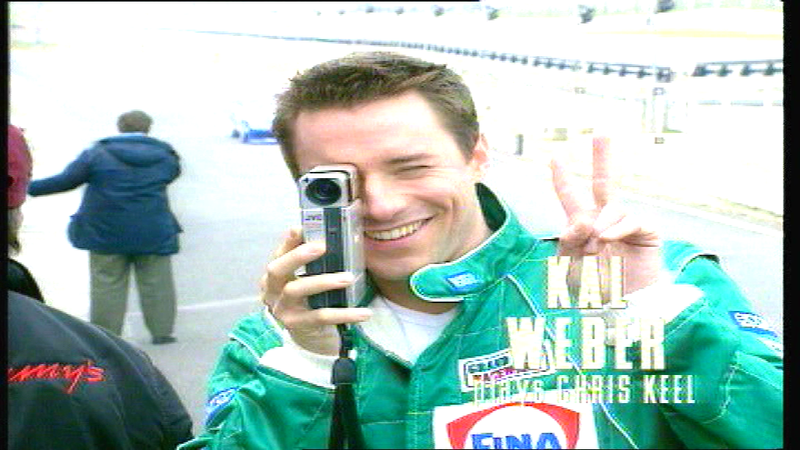 Thing is, with the DVDs already out, he's missed the boat for a bit of wedge doing a commentary- poor old Colin. He has a hint of a strong London/Cockney accent. On youtube recently, I saw him as an ARU officer in an episode of The Bill from 1992. He shot down a gunman PC Stamp was trying to talk sense to. He even apparently auditioned for 007 back in the 1990s. That would have boosted his bank balance sky high. Here is a nice rarity featuring Lorraine Kelly herself. Great stuff dsc, superb find! Promotional compilation trailer: (5.01). Contains clips of all 13 episodes and I guess is aimed at selling the series to TV networks around the world. Lorraine Kelly - 18th February 1998. (2.45). 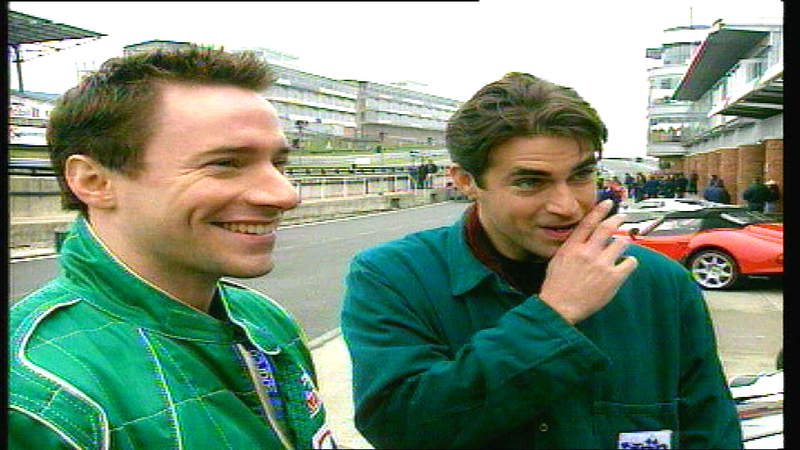 The GMTV crew film and interview the cast during the making of 'High Speed'. Pdfs of all 13 scripts and promotional material. Magazine clippings, etc. 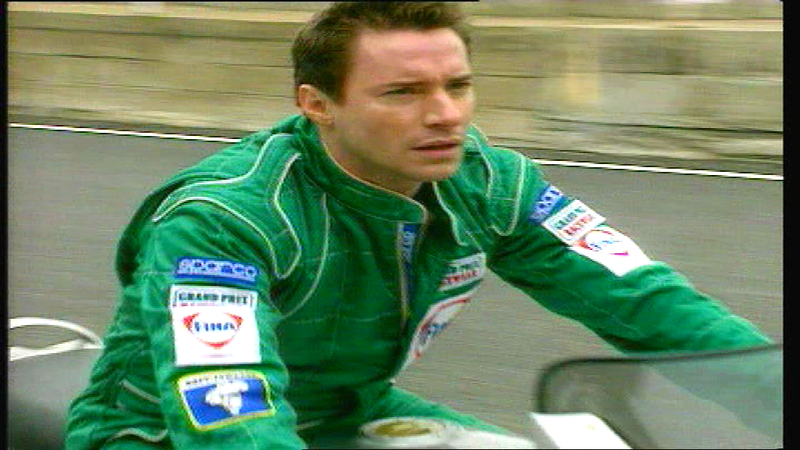 Promotional Film - dated 31st October 1997 (1.13). Clips from Back in Business. London Tonight - 13th February 1998. (2.18) Regional news report on the making of the series. 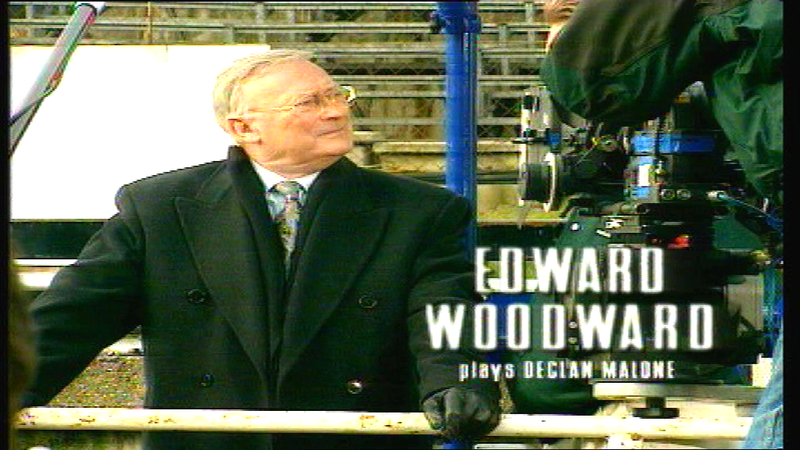 Electronic Press Kit (34.02): Interviews conducted with Edward Woodward, Lexa Doig, Colin Wells, David Wickes, Kal Webber, and Adrian Irivine post production in the summer of 1998 at Teddington Lock. Promotional Film (10.40): Clips from several episodes presumably to sell to TV networks. How attractive is Lexa Doig looking? Personally speaking, I always thought that any new incarnation of a well-loved series will be hamstrung. There was other series that was similar (and better) and more realistic. That's why they needed a well-known actor to re-join to give some connection: I know Lewis Collins was touted for the Cowley role, as mentioned in an interview with Bob Mills in 1997. I've never been a big fan of remakes per se, and the snippets I've seen from the New Professionals has just confirmed that. Concur with MIAS - Lexa looks yummy.